Yoga and meditation in the South of France. Bookings limited – register now. Visit accommodations for details on the villa rooms. Hot Yoga Evolution presents both long-time and new Hot Yoga students with a program that honors the past and looks to the future. You’ll practice the traditional 26&2 and learn exercises, postures and meditation techniques that will help you progress and make sure you don’t get stuck in a rut. We maintain the conceptual integrity of the Bikram practice and individualize the practice with powerful tools from broader movement culture that help you better understand your own body-mind and maximize your practice. Simply put, we don’t just spew the same words at you over and over and hope that you get it on your own, but we use all the good stuff that we know to help you shorten your journey for effort to grace. Being at the LUXYOGA villa eating amazing food, and taking in the Cote D’Azur over a taste of biodynamic wine with other good people certainly helps also! All levels of practice are very welcome. We know how to build a practice from scratch for beginners and how to refine the long term investment of an experienced practitioner as many teachers come to us for continuing education. Join us for a powerful yoga curriculum effective for practitioners of any style of yoga that will go in depth on the 26&2 postures of traditional Hot Yoga, and beyond to empower you to develop yourself and practice in a way that transcends any one brand of Yoga. 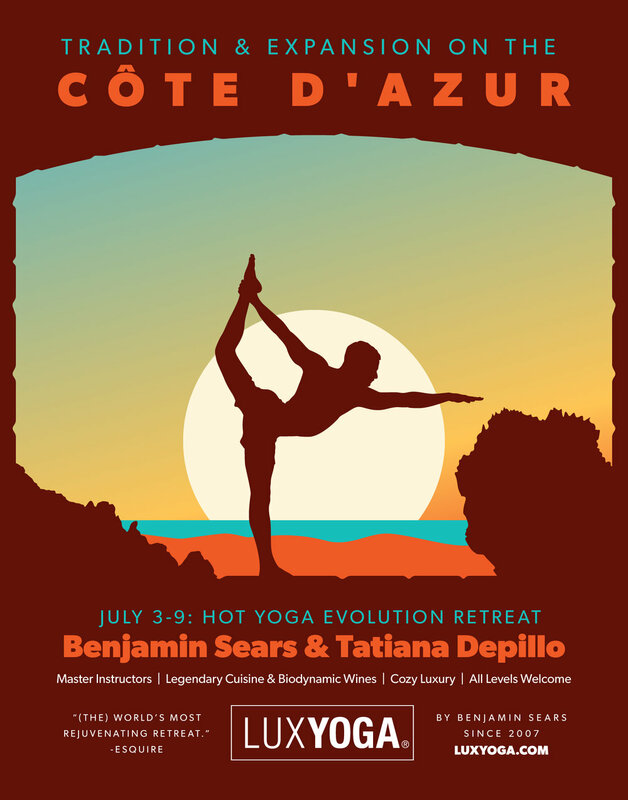 We consider our retreats a form of Yoga Higher Education: trying harder and harder can only get you so far and this retreat is for those who are ready to turn effort to grace in the yoga room with the support of the broad and deep knowledge of world-renowned teachers Benjamin and Tatiana. To pay by credit card, use the tool below to make a 50% or full payment. Bookings are limited and are first-come, first-served. Credit card payments are accepted with a minimal processing fee. All payments to LUXYOGA are non-refundable. Cancellations and credits are not possible. To pay your deposit or total via bank transfer, email us immediately at hello@luxyoga.com so you don’t lose your spot. Upon your arrival to Nice, your week in the LUXlife begins. Pick-up and drop off to Nice, France airport or hotel is included in your package. Our concierge will be in touch for your flight details. LUXYOGA is not responsible for your travel to and from Nice, France or any travel-related issues or delays. LUXYOGA is tax-deductible for all yoga professionals. **** PLEASE NOTE: To book within 45 days of the retreat, you must pay in full. Final 50% payment due 45 days prior to retreat. Benjamin is a Yoga Alliance Certified Education Provider, and all Yoga Alliance certified teachers will receive 20 Continuing Education hours to add to their resume and maintain certification compliance.